In the hotel industry, being known as an establishment that rents rooms by the hour has never been a good thing — until recently. 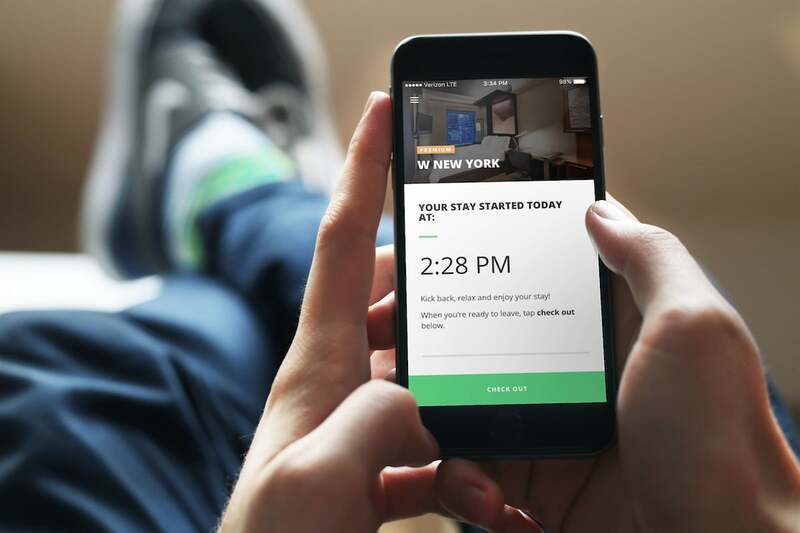 In 2015, Recharge Labs Inc. launched Recharge, a mobile app that allows harried travelers and anyone in need of a quick shower or nap the chance to book a high-end hotel room in San Francisco (where the company is based) by the minute. Now, with the support of JetBlue Technology Ventures — the airline’s technology-meets-travel incubator, which is also behind Zunum Aero’s new fleet of hybrid planes — the app is offering the same by-the-minute deals in New York City. 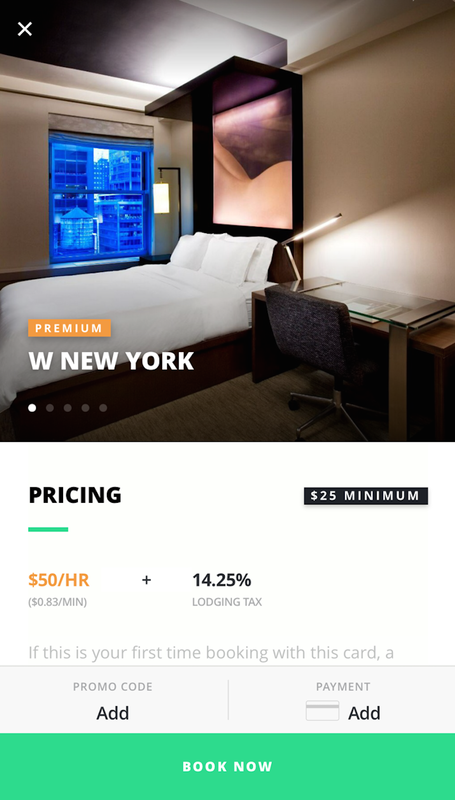 Like its Bay Area offerings, where the app has partnered with 15 hotels like the W San Francisco and Taj Campton Place, among others, its 16 NYC partners — including The Pierre, The Knickerbocker and 1 Hotel Central Park — are all four- and five-star hotels. So just who uses Recharge? According to the company, it’s a mix of families, business travelers, commuters and red-eye travelers looking for a crash-pad. Anyone who has ever had to try and find a “quiet” space to conduct a conference call or just find 30 minutes of privacy in either city can certainly understand the appeal. And JetBlue’s backing of the business, which was announced this week, along with the news that the app has expanded to New York, certainly attests to the need for such a service. Whether you want to grab a quick shower, take a cat nap or just put your feet up, Recharge lives up to its name. There is no minimum-stay requirement, though there is technically a minimum fee involved at some hotels. According to the company, the average stay is approximately two hours, with room costs ranging anywhere between $0.66 and $3 per minute, depending on the hotel. 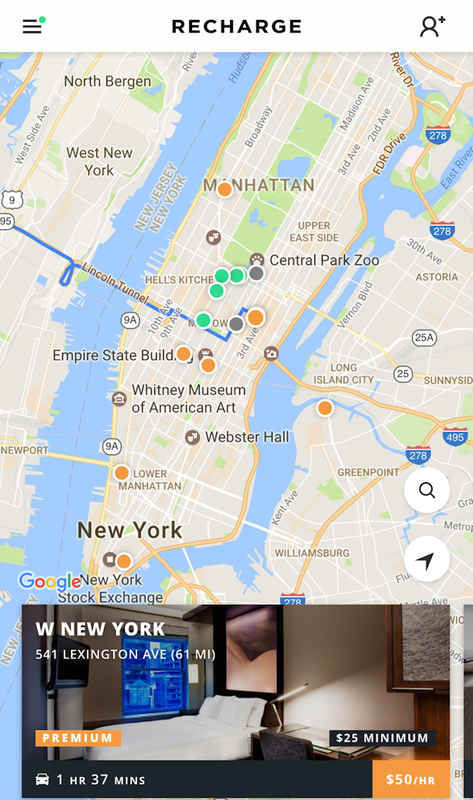 All you need to do is download the app, which is available for both iOS and Android and let Location Services track your current whereabouts so you can find the nearest short-term stay hotel. Hotels come in one of two categories — Premium or Luxury — and offer all the same amenities you’d receive if you were an overnight guest (minus the “overnight” part, of course). Once you find a hotel you like, click on it and confirm your payment information to “check-in.” When you arrive at the hotel, just check in as you normally would, but tell the front desk staff that you’ve booked your stay with Recharge. The clock starts ticking either once you get your key or 30 minutes from the time you booked, whichever comes first. (That 30 minutes is to allow for travel time, so it’s best to book right when you’re near or at the venue.) Once you’re ready to leave, simply “Check-out” through the app. When I opened up the Recharge app on a Monday afternoon, I had my choice of 10 NYC hotels. Among the listings were Premium spots like the W New York ($50 per hour with a $25 minimum), and Luxury properties like The Knickerbocker Hotel in Times Square ($80 per hour with a $40 minimum), and The Pierre, which tipped the pricing scales at $120 per hour with a $60 minimum. The Pierre had a waitlist, while The Roosevelt Hotel, which charges $50 per hour, was full. It’s also important to note that, even by the minute, hotel rooms are subjected to a lodging tax. For travelers, there are a number of scenarios where a 30-minute-plus stop for a quick shower and shave makes sense. It’s a win for the hotel, too, which — even if it’s fully booked for the night — often has any number of vacant rooms during the day, with several hours between check-out and check-in. (According to Recharge, a majority of hotel guests only occupy their rooms from 6:00pm to 9:00am). “Do you rent rooms by the hour?” has never sounded so complimentary. All images courtesy of Recharge.